EQO Home Cell Phone Signal Booster for Verizon, T-Mobile, ATT, Sprint, etc. Source: https://cellphonesignalbooster.us/weboost-eqo-signal-booster-kit/ weBoost EQO 4G Signal Booster is a plug and play kit that installs within 60 seconds and boosts reception indoors for up to 1200 square feet. With no exterior antenna to install, it is quick to install and boosts Voice, Text, 3G, 4G, and LTE data signals for multiple cellular devices simultaneously. It provides up to 32 times better indoor reception, regardless of your smartphone manufacturer and regardless of which USA or Canadian cellular service provider you use! No Internet required and no monthly fees to pay! It is independently tested and trusted by first responders. Made by Wilson Electronics, this kit with part model numbers 473020/ 460032/ U473020/ 473120 is a new type of product that introduces an easy-installation design for boosting up to 32 times stronger signal into the home in seconds. This 60 second set-up kit includes an amplifier, indoor antenna, cable to connect the two, power supply, and an easy to follow instructions. Therefore: Minimize dropped calls and calls routed straight to voicemail. Minimize stuck or late text messages. Minimize wait time for Internet pages to load. Many are upgrading their phones to 4G LTE phone that offer faster Internet speeds. Now may be a great time for you to upgrade to this new 4G LTE plug and play booster kit that you can install in just 60 seconds flat! Misspelled sometimes as webost eco and ego, weboost eqo echoes outside reception indoors and boosts it up to 32 times. Stop dropped calls and start enjoying fast 4G LTE smartphone data transfer speeds, that your new phone and carrier may have the capability to offer you. We're committed to providing you with top notch products first, with a mission to alleviate some of the stress that can result from dropped calls and poor signal. Need help choosing a signal booster that boosts cell signal in your vehicle? Or need one that covers more indoor space, than up to 1,200 sq. ft. that weBoost Eqo offers? No problem, visit CellPhoneSignalBooster.us or contact us at our website to chat live, email, or call to speak with our friendly and knowledgeable representatives. Buy your weBoost booster at https://cellphonesignalbooster.us/ and get free shipping across USA and Canada! Contact us for more details. US $379.99 For Sale! Contact us for price. Product description of EQO Home Cell Phone Signal Booster for Verizon, T-Mobile, ATT, Sprint, etc..
New version of weBoost eqo 4G is now available. If you have purchased the pre-existing version in the past, you can buy external antenna and flat cable accessory kit. New weBoost EQO Signal Booster is a multi-use device, the ideal solution for echoing and amplifying cellular signals indoors when it comes to 2G Voice, 3G Voice and Data, and 4G LTE Voice and Data. This is a big deal, especially if you're unsure which service you will be using in the near future. With the latest EQO Booster, you do not have to choose right now: Sit back, relax, and make your decision when the time comes, comfortable in the knowledge that you will be supported no matter which cellular service carrier's reception will require improvement. It will even improve service coverage of the guests that come to your home regardless of whether they're with AT&T, Verizon, T-Mobile, Sprint, or any other! Covering up to 1,200 square feet in conjunction with a strong existing signal outside, the best benefit that EQO by weBoost offers is that it is compatible with all American and Canadian carriers. Of course, a weaker signal outside will result in less coverage, but there is still no better enhancement option considering the price and quality than weBoost EQO. Part #'s of components anticipated to be 460032/ 473120/ U473020/ 473020. The frequencies it supports are: 700 MHz/ 850 MHz/ 1700 MHz/ 2100 MHz/ 1900 MHz. For those of you that are technically savvy, the amplifier unit has a SMA-Female connector. - You do not need an outside antenna. - You can use the provided antenna device for placement on a desktop-like surface either inside the home or inside the office. - Setup is complete in a matter of seconds. Simple plugging and playing, and you are done. - You can count on a signal strength gain of as much as 70 dB. In ideal conditions, -50 dB is a very good signal, and -110 dB is a dead zone (no signal). 70 dB represents a huge difference! - It is tailor-made for small apartments, small condos, and small homes for exceptional coverage across one or two rooms. weBoost EQO 473020 is manufactured by world renowned Wilsom Electronics. Boosting signals for devices such as 2G voice phones and 3G and 4G smartphones, weBoost comes packaged with everything you need to install and get going. 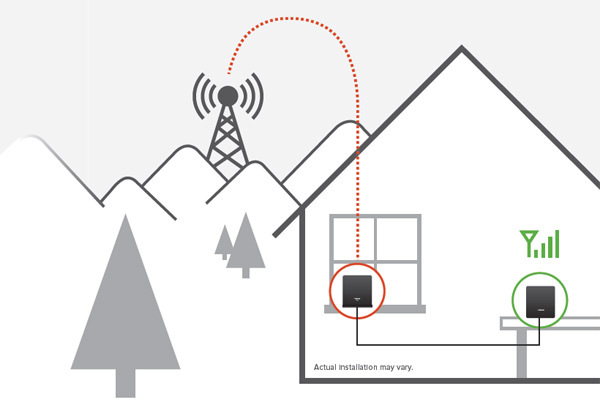 - A strong outside signal will provide 1,200 square feet of boosted coverage indoors. - A medium outside signal will provide 750 square feet of increased reception inside. - A weak outside signal will provide 100 feet of enhanced signal boost in a room. There are a number of factors at play here, including the layout of the rooms, house wall construction, and signal strength outside the home. Your results will vary based on your circumstances: You may end up with more or less coverage than the numbers we have estimated including which carrier you use such as AT&T or T-Mobile. It is not possible at this time to guarantee an exact coverage area. You want to be able to use your cell phone wherever you are. When you get an important call, the last thing you want to worry about is going outside just to get a signal. Too often we have to struggle with poor reception inside our homes or inside our offices: The more we build, the more likely it is that building will block the transmission of cellular signals. Now, however, we have an option. weBoost EQO cell phone signal booster makes it possible to boost cell phone reception indoors without using a big, bulky exterior antenna. weBoost works with any phone and any cellular service provider, and setup will take no time at all (in most cases, less than a minute). You will never have to step outside again or install an antenna on your wall or roof: weBoost is as compact as a modern device should be. Manufactured by Wilson Electronics, weBost EQO Signal Booster is a revolutionary product that will boost the cellular reception inside your house or office by as many as 32 times. Installation is simple and intuitive, and this plug-and-play booster is also stylish and fashionable, a perfect fit among all of the other gadgets in your home. Pronounced like "weBoost echo" but mis-pronounced as "weBoost eco" or "weBoost ego", weBoost EQO supports all carrier networks such as Bell, Telus, Rogers, Fido, Wind and Mobilicity in Canada. And it does the same in USA for all carriers networks by Verizon, Sprint, T-Mobile, AT&T, and others. It can provide signal coverage up to 1,200 square feet which would suffice for most practical purposes. Engineers have designed weBoost EQO cell booster with your home in mind. Enhancing cell phone reception by as much as 32 times, we boost and enhance your 3G, 4G, and LTE reception across as much as 1,200 square feet in any space. 1. The first unit (also called window unit because it is typically keep near a window where there is best signal) captures cell phone signals from all carriers, through windows, walls, and any other barriers. 2. It amplifies the signal it receives by as much as 32 times. 3. An antenna inside weBoost distributes the signal throughout your home, providing you with the best possible cellular signal reception across as much as 1,200 square feet of space. What does this kit with UPC # 811815026143 include? Home Five Band Booster Part weBoost 473020 (Amplifier). AC Power Supply Part # weBoost 859948 (5V/ 2.5A). Inside Antenna for eqo Part # weBoost 203020. 25 feet RG-58 Coax Cable Part # 291155.
weBoost eqo Installation and Instructions Manual / Guide. - Huge boost in voice and data. EQO will amplify your signal by 32 times, making it a much more effective device than anything else on the market. - Setup takes no time at all. You will be up and running in less than 60 seconds. - Works with all carriers. Whether you are using ATT, Tmobile, Verizon Wireless, Sprint, and any other carrier in United States, weBoost is a viable option for you. - One device covers multiple users. Because EQO is strengthening your signal to such an enormous extent, every member of your family can use a cell phone or tablet simultaneously. - Pay once. weBoost comes with no monthly fees attached. You buy the device, and that’s it. - 1,200 square feet of coverage. That is extraordinarily large, covering apartments, condos, and most homes. - No Internet connection needed. You can benefit from EQO with no WiFi at all. - Proven to be effective. EQO has been sent to third-party testers, who have confirmed its results, deeming it effective and trustworthy.